The perennial issue of the existence of strong organized crime structures in the Balkan region is of great concern for the whole of Europe, due to the importance of this region as a main geo-economic hub between the European Union, Turkey and the Middle East, and Russia. The United Nations International Narcotics Control Board in its 2010 annual report detailing the global trends in the illicit drug market outlines several interesting aspects regarding the organized crime activities in the Balkans. In respect to the main heroin problem in Europe, the report shows that almost all European heroin originates in Afghanistan, mostly smuggled in through Turkey and the Balkans. According to the report, the four top national markets in Europe account for 60 percent of all European heroin consumption. They are the United Kingdom (21 percent), Italy (20 percent), France (11 percent) and Germany (8 percent). The majority of the crime networks trafficking heroin into these markets is from the Balkans. The 2007 World Drug Report issued by the United Nations Office on Drugs and Crimes points to an alarming new drug alliance between the notorious South American drug lords and the Albanian drug mafia in the Balkans that already controls much of the wholesale network in Europe. The section "Concerns about Cocaine along the Balkan Route" reads, "While most cocaine shipments from South America continue to be directed towards Western Europe … some shipments to East Europe and the Balkan countries have been noticed by enforcement agencies." Further back in recent times, while the 2005 U.N. Drug report identified Kosovo Albanian organized crime groups responsible for controlling heroin market, the 2007 report, additionally, identified them as developers of the new traffic regarding the importation of South American cocaine: "This raises concerns about the development of new trafficking routes and/or the incorporation of cocaine into the range of products offered by traditional heroin trafficking groups operating along the Balkan route." The report adds that Albanian drug gangs control ports in Romania, in addition to ones in Montenegro (Bar) and Albania (Durres). "Some cases of cocaine shipments via the Black Sea to Romania and via the Adriatic Sea to Montenegro often organized by Albanian criminal groups have already been observed," says the report. Thus the traditional narcotics market structure has evolved further over the previous years and now the smugglers are able to exploit both the main road corridors of the region from east to west and north to south, but also they got a hold of the main sea trade import bases and revealed themselves into a greater and global role. The U.S. State Department International Strategy for Narcotics Control report, released in March 2010, says that the Balkan countries remain major transit points for Afghan heroin, while the war against traffickers is hampered by corruption and weak state institutions. According to the report, Albania, Bulgaria, Kosovo, Serbia, Croatia, and Bosnia and Herzegovina are used by narcotics traffickers to move Afghan heroin from Central Asia to destinations around Western Europe. To a lesser extent, Romania and Montenegro are also considered as staging posts for traffickers. Apart from being an important transit country for heroin and cocaine, Bulgaria is also a producer of illicit narcotics, the report says. With its geographic position on Balkan transit routes, Bulgaria is vulnerable to illegal flows of drugs, people, contraband and money. The Interpol is quite specific in identifying the real importance of the Balkans in the present day European narcotics market. According to the research of that organization, two primary routes are used to smuggle heroin: the Balkan route, which runs through south-eastern Europe, and the silk route, which runs through Central Asia. The magnitude of the organized crime groups in the region can be well illustrated by the case of the "Saric network" in Serbia. The organization of Darko Saric had funnelled 1.3 billion euros to Serbia, but may have amassed up to 5 billion, according to investigators. Saric and his companions laundered the narcotics money through companies in Serbia, Montenegro and "some Western European countries." Moreover, the powerful crime clan, said to be one of the major cocaine suppliers in Europe, was involved in the attempt to smuggle 2.7 tons of cocaine to Europe in the autumn of 2009 from Latin America. Since the sheer amount of this trafficking attempt is quite substantial, it can be estimated that the nexus between the South American cartels and those in the Balkans is becoming stronger and of importance for the world police authorities. In this case Serbian and Montenegro citizens were involved, as well as suppliers from Argentina and Bolivia who worked together for years and in a fashion that resembles the workings of any modern multinational corporation. Furthermore, reportages by Bulgarian media have revealed that Bulgarian criminal gangs are among the major cocaine traffickers in south-eastern Europe. More specifically, a Darik News investigation noted that "over the past months, local drug dealers have abandoned the heroin trade, because of the drug's high price and the low demand and they switched to cocaine." The Bulgarian journalist Nikolay Hristov reported that five major organizations in this Balkan country have their hands on the cocaine market. Similar findings are to be found for Greece also, where in Athens five well-organized criminal gangs control the local cocaine market with Greeks, Albanians, Bulgarians and Georgians to act as kingpins of such illegal trade. The perils associated with organized crime activities in the Balkans have long been associated with wider ramifications in other countries due to the penetration of the European crime scene by Balkan groups. For instance, about 80 percent of the Hungarian heroin market is controlled by the so-called Albanian mafia, which then invests its profits from that country by procuring weapons from Italian crime groups. Therefore the criminal syndicates not only exploit local markets and facilitate the spread of illegal substances, but also assist in funnelling further criminal action into other countries and finally create a wide network of illegal activities that involve a large number of individuals and serious problems for the authorities in different states, who find it hard to either control or even identify the complexity of the situation. Since the Balkans is one of the main import points and staging grounds for the expansion of organized criminal activities in the European Union, a pan-European anti-crime policy is expected to be centered in that region. Moreover the security authorities should be aware of the flexibility and the adaptability of the criminal groups that seek to maximize their returns at any given moment, and in many instances they tend to create an illegal market as soon as they realize that a need has to be met by non-legal means. For example, it is quite likely to expect a shift from the traditional trafficking operations that transfer immigrants from Asia and Africa to Europe, towards an inter-European trafficking movement of illegal immigrants who have been stuck into countries with low or even negative economic growth. The case of Greece is significant, since the country had a 5 percent drop in GDP in 2010 and possibly another 5.5 percent in 2011. Already there is an exodus of immigrants from the country. Illegal ones from Asia and Africa find it quite hard to move elsewhere due to lack of documents. It is estimated that approximately 400,000 individuals are in such a situation in Greece, who are increasingly at risk of no employment, due to the dramatic drop in the construction business and the recession in the commercial and industrial sectors. If one adds the number of illegal immigrants in Spain, Portugal and Italy who face similar concerns, a new illegal market seems to be opening that will almost certainly be taken advantage of by the same networks that presently deal with trafficking of weapons, narcotics and persons. In parallel, both Bulgaria and Romania enter the Schengen treaty on October 1, and that will make them an attractive target for Turkish and Middle Eastern human traffickers who will try to exploit the "opening" of the borders towards the European Union in that region. Moreover, a much worrying trend is the formation of ethnically mixed gangs in the Balkans that tend to recruit people from various states and conduct their operations by adapting fully to the local environment. For the moment there seems to be a combination of Bulgarian and Romanian gangs and of Croatian and Montenegrins ones. The Albanians often join Greek gangs in Greece and the Turks are well placed within gangs in FYROM, Kosovo and Bulgaria. 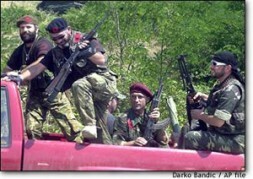 Yugoslavian gangs encompassing citizens from most ex-federation countries are active as well as networks including Middle Eastern and Western Europeans. Thus the work of the security services becomes more complicated; the criminals can use the outreaches of their individual members to penetrate each country, acquiring much-needed information and local resources. Lastly the current criminal groups in the Balkans have already amassed a significant amount of capital that cannot be numerated precisely, but it can be safely assumed that is reaches quite a few billion euros, along with thousands of properties and merchant companies. Thus, sooner or later this criminal capital will have to be laundered through the legal system. That requires the collaboration of financial institutions, which likely will be concentrated in the Balkans, since the rest of the European banking system would not allow such a massive breach of regulations and most importantly a change of balance in the already established equilibrium of capital power in Europe. The Balkans, already known for its corrupted public sector and proximity to the Middle East, will most likely become an important world hub for money laundering and the creation of new business elite with a direct criminal background. A trend of such nature already occurs and it will become more visible in the short term. The divergence in economic growth in the European Union and the rise in unemployment in at least half of the E.U. member states will inevitably provide yet another golden opportunity for the Balkan mafia, as the wars of the 90s were for contraband trade, and the ease in travel in the 00s for their human trafficking operations and their spectacular global criminal expansion.